As a customer, you can sell both paper and electronic CharityMania tickets. We create a personalized web page for your organization that allows people to buy CharityMania tickets online and support your organization. Electronic CharityMania tickets help you raise money from people that are located outside your immediate geographic area. See below for details about how the program works and how you can use popular online tools, such as email and Facebook, to promote your cause. The CharityMania team has a special cause that we support every year. We support the Alzheimer’s Association through personal donations and through our own CharityMania fundraiser. If you would like to see a working example of a fundraising web page (and electronic ticket sales), view our Alzheimer’s Association fundraising web page… and consider making a donation to this great cause! There is no additional cost to enter the eTicket Program but there is a small credit card usage fee on each ticket purchase. This fee is usually about 2.5% of the purchase price plus 30 cents per transaction. This fee is simply deducted from the profit you make on each sale. In minutes, you can activate your organization’s personalized fundraising web page that allows you to promote your cause online. People who want to support your organization can purchase tickets with just a few clicks and a credit card. You track your progress with the fundraising thermometer on your web page. When you sell electronic CharityMania tickets (in addition to your paper tickets), you can raise money from people who do not live in your local community. Ticket sellers can take advantage of popular tools like email and Facebook to promote your cause to 1,000s of friends and family, no matter where they live. Direct your supporters to your fundraising web page (see step 1) where they can contribute to your cause with their credit card. People who support your cause get a CharityMania Ticket and a promotional Sweepstakes Game Card (see next step for ticket details). 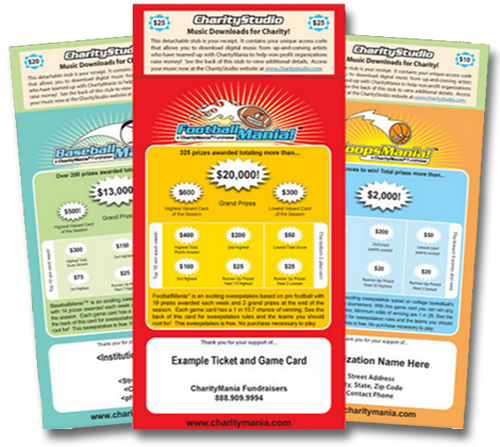 Electronic CharityMania tickets offer all the same benefits as paper tickets. The only difference is that they are delivered with email and are printed out at home. They are the easiest way to raise money from people that don’t live in your local community. You’ll never need to mail paper tickets across the country again!